There are some herbs that I would hate to be without in my dispensary and Motherwort is most definitely one of them. 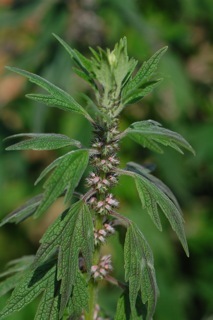 Motherwort, Leonorus cardiaca, is a member of the mint family (Lamiaceae) and has their characteristic square stems and opposite leaves though, unlike most other mints, the leaves are deeply toothed and cut into three pointed segments. The pinky flowers appear in whorls around the stem and the calyxes are very prickly so beware when harvesting! 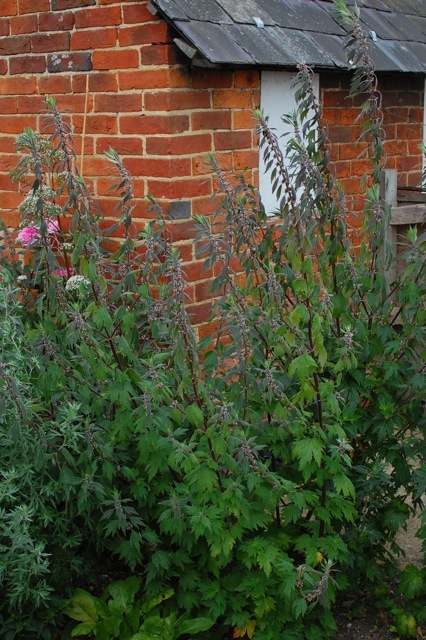 This is the second year I have grown Motherwort but the first in which it has really flourished as it was kept in pots last year and was a little cramped. I only have three plants but it grows large and tall so this is enough for a fairly good harvest – enough for about three litres of tincture and a small amount of dried herb. With this herb, the clues to it’s most popular uses lie in its names, both common and Latin. 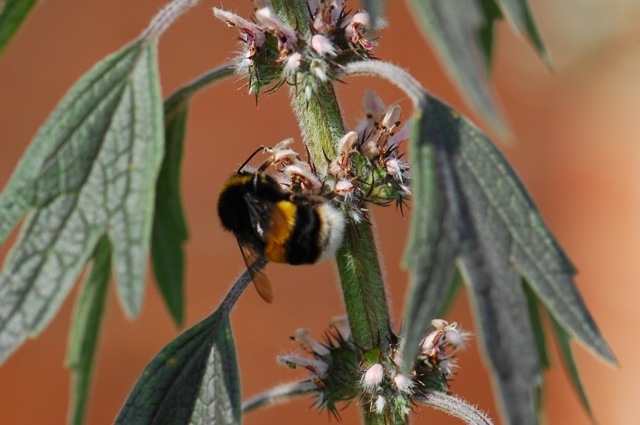 It’s been known as Motherwort for centuries as it’s often considered a women’s herb, suitable not just for mothers but women of any age from puberty to menopause. Culpepper tells us, “it makes women joyful mothers of children, and settles their wombs as they should be, therefore we call it Motherwort.” It is helpful for painful periods whether the cause is muscular tension or congestion as it is both anti-spasmodic and dispersive. It is considered an emmenagogue as it helps promote delayed menstruation and is useful in labour. Potter’s informs us it, “is especially valuable in cases of female weakness and hysteria, acting as a tonic to the generative organs and allaying nervous irritability.” In modern lingo that means ‘good for PMS’! It is also regularly used for people who feel stressed and restless during the menopause. The soft pink flowers with their hidden spiky calyxes remind me an archetypal Mother, seemly soft and fluffy but with a very sharp tongue when you cross her or threaten her children. The second part of its Latin name, cardiaca, refers to its affinity with the heart. The first part, Leonorous, is said to have come about due to the plants resemblance to a lion’s tail but also because Leo was seen as the ruler of the heart. 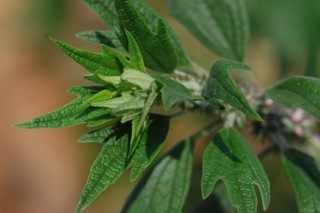 Culpepper wrote, “Venus owns this herb and it is under Leo” indicating that it was a female tonic with particular uses for the heart. Dr Christopher believed it “vies for the honour of being the best heart tonic known. It calms and supports the heart and nerves and may be used in large doses.” It helps slow and regulate the heartbeat so is useful for tachycardia and has a mild vasodilating effect. Of course it goes without saying that any heart condition needs to be checked out by a professional and consult a herbalist first if you are already on heart medication. It is particularly indicated for palpitations where the cause is anxiety and nervousness as Motherwort is also a useful nervine. It has been used for sleeplessness, anxiety, nervous tension and feelings of emotional instability. It has also been used to help people with cold hands and feet as its dispersive qualities help equalise peripheral circulation and heat. By relaxing constriction, Motherwort allows energy to move more freely around the body. Considered a useful herb for hyperthyroidism it treats many of the symptoms of this condition; palpitations, anxiety, restlessness, tremors etc. Motherwort contains essential oils which contribute to its dispersive quality, tannins which help make it a useful uterine tonic along with alkaloids, iridoides and cardiac glycosides which contribute to its nervine and heart tonic properties. Bees, who are well known for their sophisticated tastes, adore it. Being aromatic and pungent it helps to disperse stuck energy, this is why it is so useful in delayed menstruation, retention of the afterbirth, fevers and poor digestion – it moves. The combination of bitter and pungent tastes make it particularly suitable for ‘kapha’ type people who can tend to be overweight and a little sluggish. The relaxing, nervine qualities can make it good for Pitta or Vata types too, depending on their individual picture. I don’t dry a huge amount of Motherwort as I really don’t use a lot in teas but I do use it as a compress for menstrual cramps. This is only really suitable to use if you are at home but it can prove very effective in easing pain, spasm and discomfort. All you need to do is make a strong tea of dried Motherwort and soak a flannel in it. Wring the excess liquid out and lie the flannel over the abdomen or lower back, depending on where the pain is most intense, and relax with a hot water bottle on top for a short while. Refresh the flannel with more tea and repeat a few times until you feel better. Oh Lucinda, your little lion pawing at the Lion’s Tail is so adorable;o) Got to love Bartram’s! I refer to my copy constantly:) I find her a wonderful helper for menopause and it’s associated challenges, as you mention, and have started giving Lily (age 7) 10 drops in a bit of hot water several times a week. I have a feeling that one is going to have early menses as I did (age 9), from all her emotional outbursts and restlessness she is displaying this year. Yes Bartram’s is a great all purpose reference isn’t it. It was one of the first books I had. The chubby bees are lovely aren’t they, such a pleasure to see them on the plants and looking so healthy. 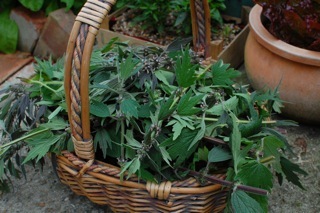 Motherwort is such a lovely herb, I completely agree that I just couldn’t be without her! I have a motherwort which is in it’s third year (curious because I thought the plant was biennial) and she’s monstrous (reminds me of your comfrey monster!). I think I could supply the state of Vermont with Motherwort from this single plant 🙂 Anyhow, you’ve reminded me that I need to get to harvesting and tincture making soon – as she’s just begun blooming. I especially love what you say about the flowers resembling the archetypal mother – so true! And what a great idea to make a compress for menstrual cramps. Also love your adorable black cat (can’t remember her/his name?) chasing the lion’s tale! Taliesin just discovered that linden flowers make great toys (to my dismay when he knocked my whole basket to the floor). Always great fun to see what takes their fancy. Danielle, a giant Motherwort, how fortunate! My monster comfrey has been suffering of late having met its match in our new arrivals… more on that later in the week. 🙂 I love the image of noble, handsome Taliesin playing in clouds of Lime blossom. Serenity is our black cat, all of them are female, poor Mark has to live in a house full of girls! 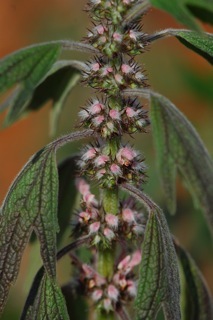 I have never grown motherwort. Perhaps it is something I should think about. It seems to be a plant that would suit this garden, especially with the bee connection. I shall tell my daughter about the remedy for period pain……….hopefully it will help, where other things have failed. I am so enjoying this time with you……tku for sharing all your remedies. I so enjoy exploring my garden now and thinking about how I can use them in tincutres etc. I have lots of elderberry on my shrubs….now all I have to do it wait for them to ripen. 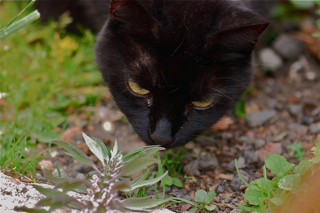 BTW love the image of your beautiful black cat……..
Something very special about black cats. 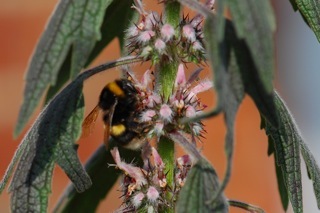 I think Motherwort would be a perfect addition to your beautiful bee friendly garden. I so hope you enjoy your elderberries, I’ve seen a few black ones already, everything is so early this year! I agree about black cats. 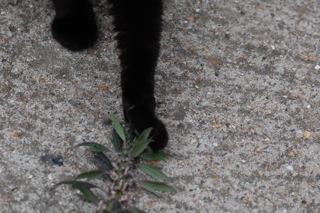 She is my little familiar and always comes out harvesting and medicine making with me.